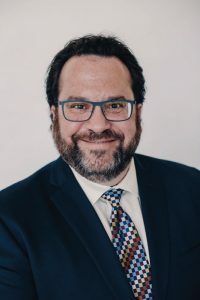 In April 2018, the Roseville, Minn.-based Industrial Fabrics Association International (IFAI) named Steve Schiffman, the association’s then vice president of media and sales, new IFAI president and CEO. Schiffman, with a career history in publishing, joined the staff of IFAI in 2013. Commenting on the announcement, retiring IFAI CEO Mary Hennessy said: “Steve has done a great job for IFAI since joining our team five years ago. Following IFAI Expo 2018 in Dallas, Textile World editors spent a moment with Schiffman to gain insight into the association and his new leadership role. TW: Congratulations on your new position with IFAI. What are your initial impressions of the organization? Schiffman: Thank you very much. I’ve been here a while and had the opportunity to experience most areas of the association through my various responsibilities. My transition has been seamless so far for a variety of reasons. Mary was gracious with her time helping me get up to speed, the board has been very supportive, and the staff has adapted well and embraced the change. We have a great team who really cares about our members and want to contribute to their success. TW: With your background in publishing coupled with IFAI’s multiple publications, how important are the publications to the association and its divisions? Schiffman: We have strong media brands, starting with our flagship Specialty Fabrics Review. Each of our division-specific publications are also strong in each of their market segments. Our editorial team works with our division members and staff to identify important subjects to feature. Our print publications remain viable, relevant and frequently referenced as the most important member benefit. Our readers tell us that our content is valuable and over the past few years we’ve created brand extensions for all our print publications including monthly and twice monthly e-newsletters, custom content and, of course, our websites. TW: What are the benefits of IFAI membership? 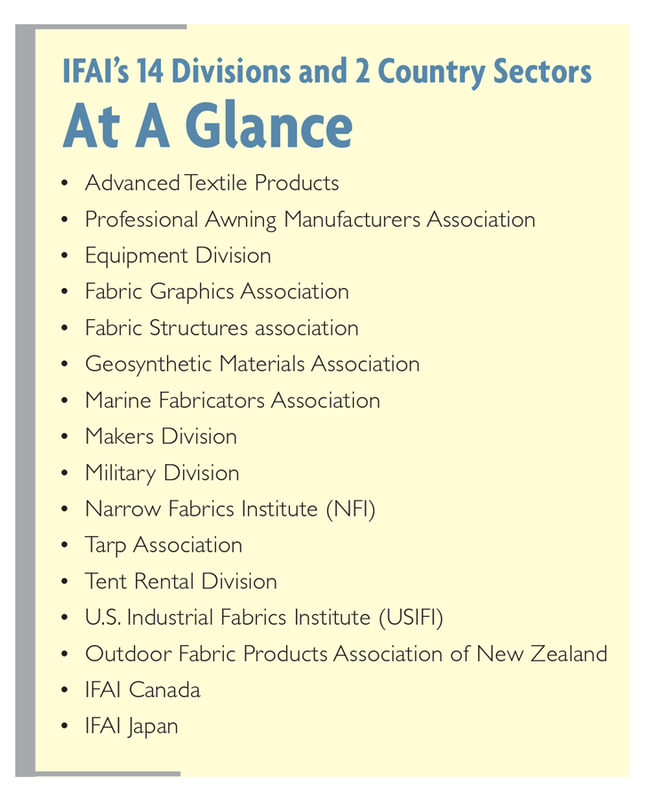 Schiffman: We have core member benefits that have remained constant over the years including a subscription to Specialty Fabrics Review and a division specific magazine, if applicable; access to InfoCentral, a fabric and product sourcing guide; a variety of educational offerings including access to educational video content; and free listings in our magazines and discounts for events, workshops, job postings in the Textile Career Center, e-store purchases, business services, and more. Suppliers also receive discounts on print advertising and exhibit space at both IFAI Expo and our Geosynthetics Conferences. We’ve recently offered a new Energy Savings Program where members can save money on electricity and natural gas. We also are hoping to launch two other new benefits soon — the Textile Industry Retirement Plan and Textile Industry Health Plan. TW: Many TW readers are familiar with IFAI Expo, but please expand on other events that are central to IFAI’s mission. Schiffman: Our next largest event after IFAI Expo is our Geosynthetics Conference which is now produced annually. Our division events include Marine Fabricator Conference; Tent Expo/ Tent Conference, which alternates each year; Outlook Conference; Smart Fabrics Summit; and our newest event launch, Women in Textiles Summit. TW: With IFAI Expo in Dallas now a wrap, what trends did you take away? Schiffman: I think the overarching takeaways were that companies are embracing technology and automation, reimagining business practices and innovating to prepare for the future. As customer needs continue to evolve, their expectations of customized products will continue to increase, and companies want to be prepared to meet those needs. TW: What is your perception of the health of the industrial fabrics industry, and what are its biggest challenges? Schiffman: I think the Specialty Fabrics and Technical Textiles industries continue to be strong. The feedback I received after speaking to many companies at IFAI Expo is that things are good right now. Early 2018 weather issues slowed sales for a while, but they bounced back as the weather improved. Finding trained sewers continues to be a challenge for many companies. The current tariffs remain a concern at different levels for different companies which makes longer term business planning more challenging. TW: How important is member education to the IFAI mission and what forms does education take? Schiffman: Member education is central to our mission. We produce a significant amount of content across a variety of different channels to help our members grow and prosper. Education used to be limited to our publications and events. Over the past few years we’ve launched educational webinars in most of our divisions that allow members to listen to content designed to help them succeed, either live or later on-demand. We also believe there is an opportunity to bring education to members through hands-on workshops. Our Video Technical Library has just scratched the surface of providing educational videos members can use to educate their employees and we’re in the planning stages of developing podcasts to make it easier for members to access our content anytime from anywhere. In April 2019, we will try something new in how we deliver education by launching the Smart Fabrics Virtual Summit, a full day of programming available online, in cooperation with the U.S. Department of Commerce. TW: Looking forward, what do you think are the biggest challenges facing IFAI members? What about opportunities? Schiffman: In our 2018 Membership Survey our members told us that their biggest challenge is finding qualified employees. We’ve always worked to provide resources for education and training through IFAI Expo, our Makers Division and magazines. Most recently we’ve added to those efforts with our new Textile Career Center, Technical Video Library, Small Business Center and an increasingly robust webinar schedule. I think the opportunities are in leveraging automation and innovation to help create efficiencies and better meet customer demands. TW: What does the future look like for IFAI? Schiffman: I’m excited about the future of IFAI. Even though member satisfaction is at an all-time high we’re constantly trying to improve and identify ways to enhance member value and return on their investment. That said, we’re not without challenges. We’re working to create a better understanding of IFAI Expo and how it’s part of a member driven trade association providing value to members every single day of the year. You’d be surprised at how many people don’t make that connection, so we must help them get there. We’ve added staff to our marketing department and we’re aggressively working to drive Expo attendance and membership by expanding our reach and marketing strategies to new markets where IFAI can provide value. We’re also interested in more collaboration with similar associations, events and other partners to the benefit of our members and the industries we serve.